1.Open 20-sim and from the Help menu click About. If your version number is lower than 20-sim 4.1.2.3, please update 20-sim first. 1.Build your model and run a simulation, until you are satisfied with the response. 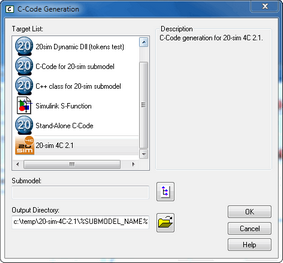 2.In the Simulator, from the Tools menu select Real Time Toolbox and C-code Generation. The C-code Generation dialog will pop-up. The C-code generation dialog in 20-sim. If the 20-sim 4C target is not shown, please check if you are using the right version of 20-sim (4.1.2.3 or higher). 3.Select the 20-sim 4C Target. Now 20-sim 4C will be opened with the C-code from 20-sim.